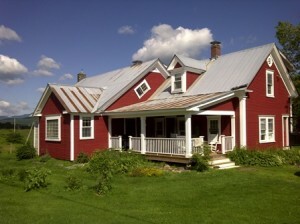 Quaint Vermont Farmhouse located close to Stowe for rent. This six Bedroom, three bathroom fully renovated home features a new chef's kitchen, restored wide plank floors and a brand new gas fireplace. Fully furnished there is a beautiful custom made dining room table large enough to seat 12. Other features include a washer and dryer, cable TV and wireless internet. This property is truly one of kind, with stunning views of Mt. Mansfield, experience that unique Vermont farm house quality with all the trimmings of a brand new home. There is a master suite with an attached bedroom that is perfect for families with small children or those who want to spread out. Additionally there are four more rooms that offer privacy and comfortable sleeping. Located on the property is a swimming pond with diving board and fruit trees. Additionally the owners keep horses nearby to add to the appeal. This property is perfect for those looking for space to spread out and be a short distance from the hustle and bustle of town. During the summer this property would be an ideal setting for hosting a small wedding or to be used as a central location to launch daily outdoor activities such as road and mountain biking excursions. In the winter you are just 15 minutes from Stowe Mountain Resort and for those who like to snow machine you have easy access to the VAST trails. Available at $2,000 per week or for the winter season at $15,000 per season. Call us today about this beautiful property.